OPI Gelcolor A Good Man Darin is Hard to Find 15mL GC H47 But you’ve found it – in this zesty..
OPI Gelcolor A Grape Fit 15mL This rich purple was made for you. ..
OPI GelColor Alpine Snow 15ml A fresh, crisp white. ..
OPI GelColor Amazon ... Amazoff 15ml I’m making the switch to this deep jun..
OPI GelColor Base Coat 15ml One coat provides a gentle fou..
OPI GelColor Bastille My Heart 15ml Make hearts race in this glimmer of ric..
OPI GelColor Big Apple Red 15ml Bright, shiny and ready to take on the world! 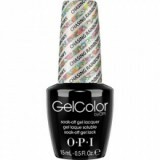 ..
OPI GelColor Black Cherry Chutney 15ml A deliciously dark black-red. 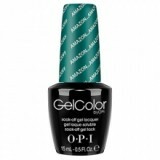 ..
OPI GelColor Black Onyx 15ml Basic black - and basically fabulous! ..
OPI GelColor Bogota Blackberry 15ml A berry deep, dark wine shade. ..
OPI GelColor Bubble Bath 15ml Sweet candy pink. ..
OPI GelColor Cajun Shrimp 15ml A spicy shade of coral ..
OPI GelColor Cant find my czechbook 15ml Pastel I hope you take credit, because I must ..
OPI GelColor Chasing Rainbows 15ml The rainbow glitter off colour dreams. ..
OPI GelColor Color So Hot it Berns 15ml Cozy up to this warm red apres-ski. ..